A capacitor is used in the capacitor start motor for giving the necessary phase displacement. 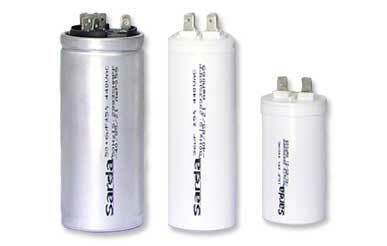 The capacitor remains permanently in series in starting and running condition. These types of motors are used mainly in ceiling and table fans where low torque is required. Motor run capacitors are manufactured using the zinc-aluminum alloy heavy edge metallised polypropylene film adopting the latest state of the art technology in processing. They are conforming to IS:2993 applicable for motor run application for continuous duty cycle. These capacitors are used in domestic & agricultural pump sets,control panel, submersible pump sets, jet and monoblock pump sets, air conditioners, coolers, refrigerators etc. Capacitance – 4 Mfd to 400 Mfd. Voltage Rating – 440, 500, Volts. 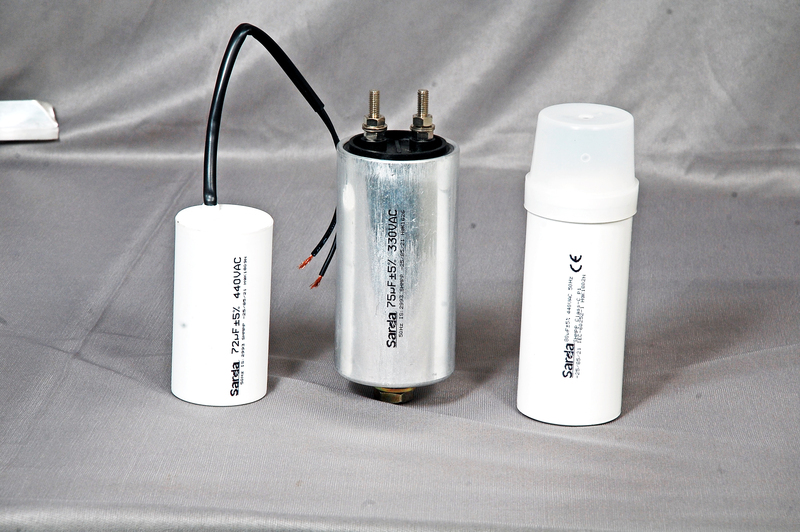 These capacitors are used for domestic & agricultural submersible pump sets; jet & mono block pump sets. Capacitors are used to achieve the electrical phase shift between the start and main winding of the motor to provide high starting torque and smooth acceleration over a wide motor speed range. Motor run capacitors are manufactured using zinc aluminium alloy heavy edge metallised polypropylene film adopting the latest state of the art technology in processing. They conform to IS:2993 applicable for motor run applications for continuous duty cycle. 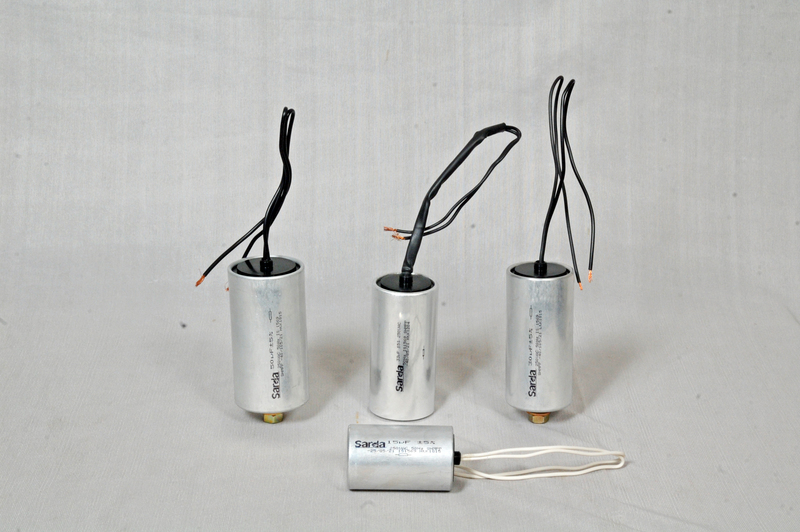 These capacitors are connected in series with the main winding of the compressor in order to achieve rotating magnetic flux which keeps the motor running. In addition to the above capacitor, electrolytic motor start capacitor is also connected to the start winding of the motor to provide the necessary torque in order to overcome the inertia. The function of start capacitor is only to start the compressor within a short duration till it attains rated speed and gets disconnected by the operation of the centrifugal switch, thereafter only the run capacitor remains in circuit. An important characteristic of any discharge is that, once started, the current tends to increase instantaneously to a destructive value. A choke (referred to as ballast) is incorporated in the AC circuit to limit the current to a safe value. Fluorescent and Discharge Lamps have a inherent low power factor of the order of 0.4 lag to 0.5 lag. Power factor is improved by the use of capacitor having capacitance value ranging from 3 MFD to 45 MFD and power factor is corrected to 0.85 lag to 0.90 lag which is acceptable for proper utilization of power. The capacitor provides a low impedance path to interference currents & helps to by pass any third harmonic currents. 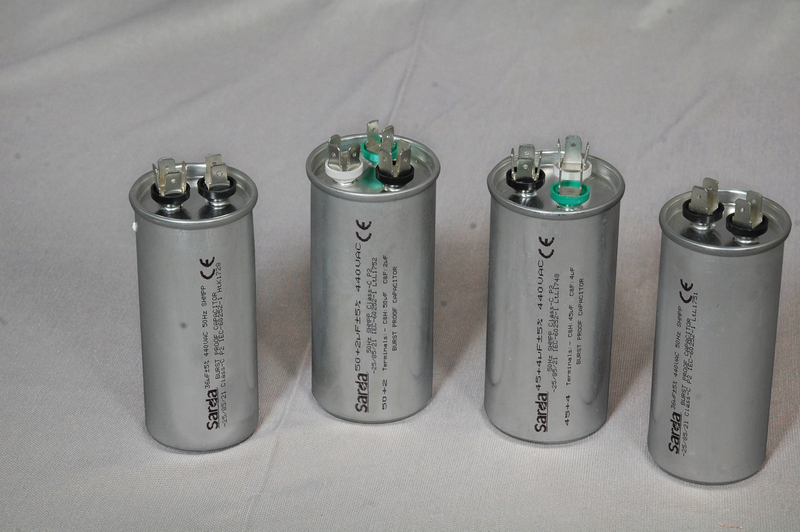 These are special type of capacitors made of heavy edge Zn-Al Alloy metallised polypropylene film for handling higher currents and ensuring higher insulation properties, with very low dissipation factor. 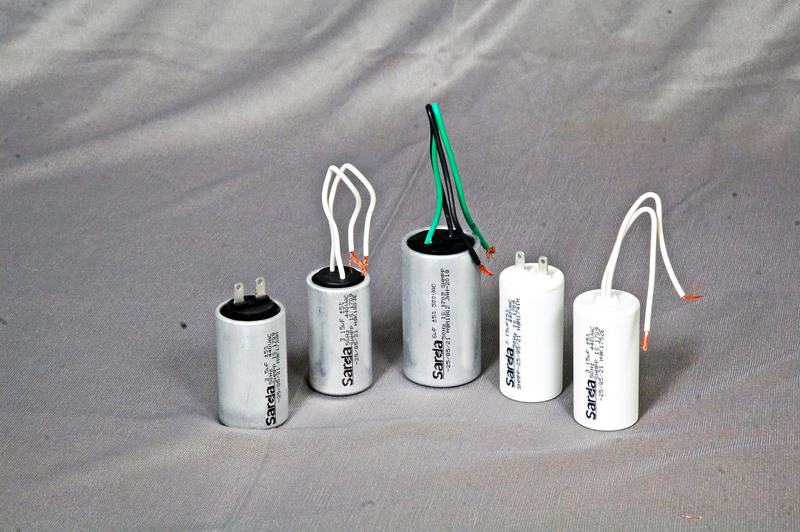 These capacitors have an advantage of compact size, easy handling coupled with inbuilt safety mechanism, which disconnects the capacitor in the event of any abnormal conditions like over voltage or over currents. Capacitor is used as a component in the tuned LC circuit of constant voltage power source. These are designed for continuous duty cycle operation or as per the customer’s specific requirements. The output from capacitors are used in the AC input stage as filters which also gives additional advantage as a power factor correction to the unit. All these capacitors are designed to take care of harmonics upto total of 5% THD (Total Harmonic Distortion). If it exceeds this limit, it would be necessary to use harmonics fillers in order to filter out unwanted frequencies, which can cause heating effect due to high current drawn by the capacitor. Selection of suitable capacitors plays a very crucial role in the life expectancy of the capacitors. Hence it is absolutely necessary to use proper capacitor value with voltage/current rating matching the specific application. 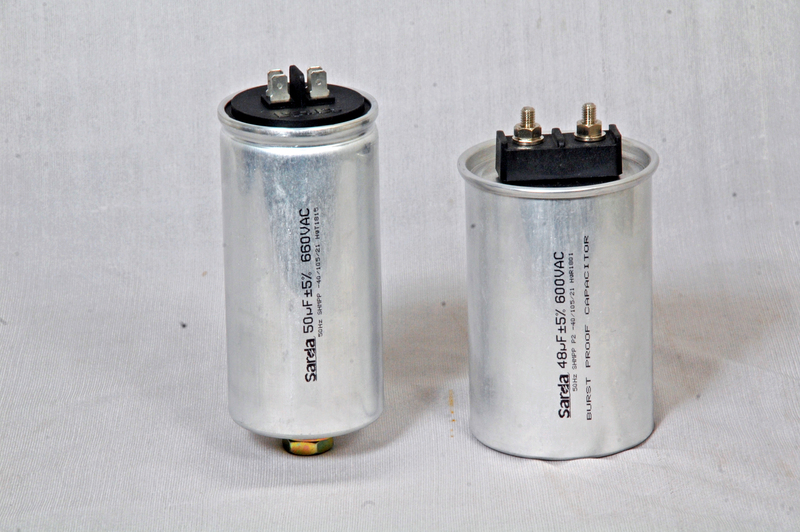 Capacitors are housed in aluminum cylindrical can and provided with bottom studs for easy mounting.Capacitors above 10 MFD value can be provided with screw type terminal for handling higher currents and also for better mechanical fitment with cable lugs. Proper selection of the capacitance value will enhance the performance and life expectancy of the capacitor in the tuned circuit.